Topics will address the records available and the research skills required to search Greek lineage, both in the U.S. and in Greece. Conference costs are covered by the event sponsors and there will be no charge; however, seating is limited and registration is required. To register, send an email to Stamatis A. Ghikas at hellenicchamber-nyc@att.net. 9:15-9:45 Dr. Peter C. Moskos. "Greek Americans: Struggle and Success"
Topic: Learn which documents provide pertinent information for Greek research, including Passenger Lists, Social Security Applications, Death Certificates, Obituaries and others including resources available online. 1:15-2:15 Dr. Marietta Minotos. "Records Available from the General State Archives of Greece"
Topic: Turn a vacation in Greece into a journey of discovery; how to prepare for a research trip. 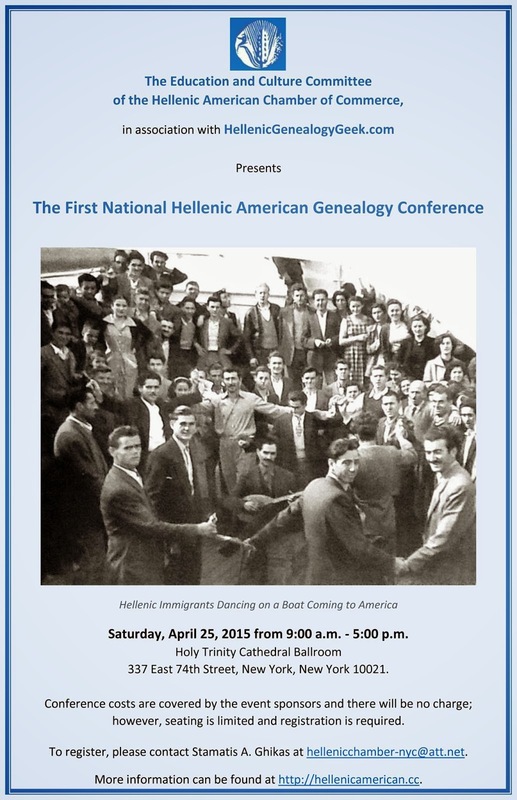 This event is sponsored by the Education and Culture Committee of the Hellenic American Chamber of Commerce. Chair: Professor Louis Katsos; Co-Chairs: Michael Kalavritinos and Tassos Pardalis. I would love to attend this event, but I live far from NY. Will there be a CD for purchase? Good question, Pat Spears. I'd like one, too.